Facebook is rumored to go public on May 18th. Facebook is expected to have its Initial Public Offering (IPO) this Friday, May 18th, and we’ll have IPO-related posts, events, charitable drives, and promotions all week. First order of business: if you’re a Facebook user, what might the IPO mean for you? First of all, an IPO (or “going public,” as it’s commonly called) simply means that shares in the Facebook company will be sold on the Nasdaq Stock Market. For most regular people, this sale won’t mean a thing: only wealthy investors will have a chance to buy in. Facebook is rumored to set its valuation at $90-95 billion, or about $28-$35 per share. After the IPO, Facebook will have to take its shareholders’ wishes into consideration when making business decisions, and it will be under pressure to meet revenue and profitability goals. Some analysts say that Facebook will have to increase revenues by 41% over the next 5 years to meet its high valuation. If you’re on Facebook, you’re not the customer: you’re the product. 85% of Facebook’s revenues in 2011 came from advertising. Their valuation depends on their advertising revenue, and their advertising revenue depends on their ability to collect even more personal information from users. Facebook isn’t free: you pay for it with your data. 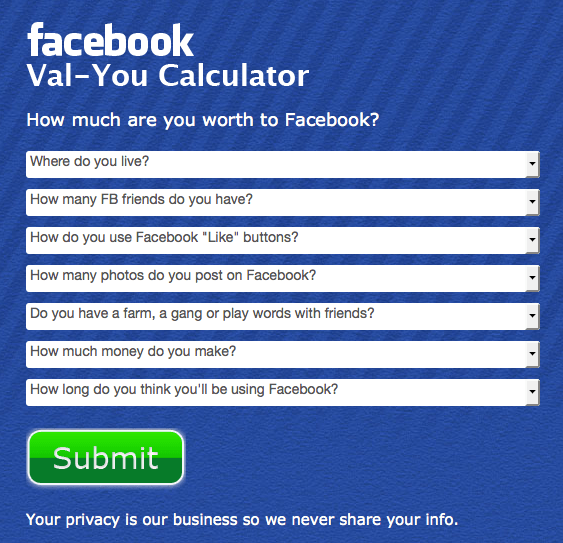 We created a Facebook Val-You calculator, which you can try out on Abine.com/goprivate, to demonstrate that each Facebook user holds monetary value. That value is going to have to go up over time in order for Facebook to perform against its projected $95 billion valuation. 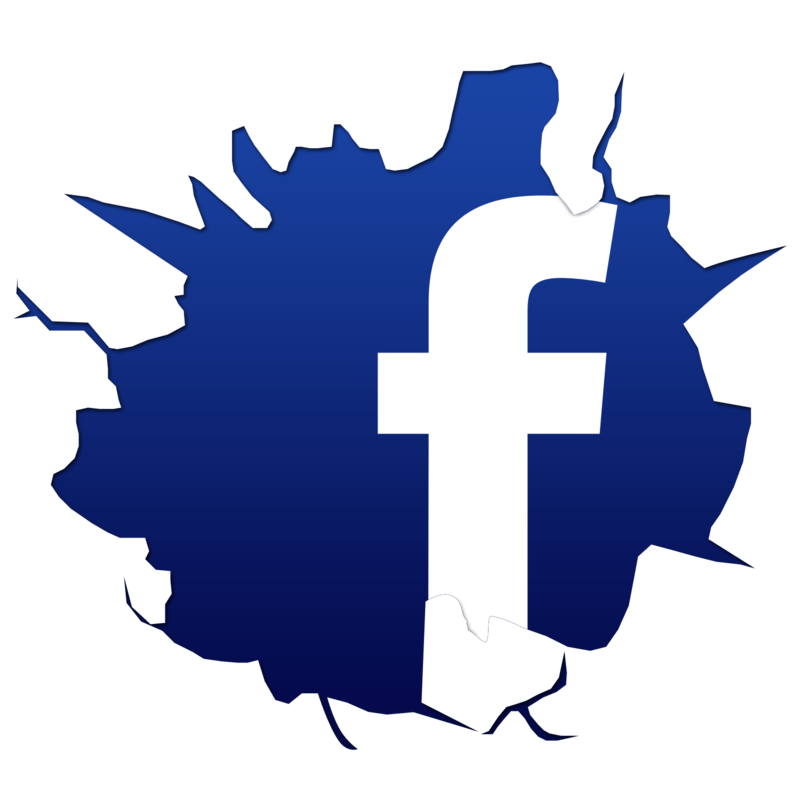 Our Facebook Val-You calculator relies on data from the Facebook S-1 Filing, independent financial and market research analysts, data from Facebook advertisers, and our own internal modeling and estimates. It considers how you use Facebook along with other personal details to determine approximately how much revenue you may generate for Facebook this year. Answering the questions gives you a dollar amount that you’re worth to Facebook each year. Facebook’s going public. Now’s the time to GoPrivate. We’re starting to see a shift of a large group of consumers who want to control how their data is being used on Facebook, from emotional reactions to creepy apps like Girls Around Me to behavioral changes like more Facebook users changing their privacy settings. In our survey of Facebook users, 70% of them said they don’t trust Facebook with their personal information. There was a 43% increase in the number of Facebook users who said they are “very concerned” about their privacy after the IPO compared to before it, and there was 76% growth in the number of Facebook users adjusting their privacy setting between 2009-2011. If you want more online privacy, now’s the time to get it. What do these results tell us? People want to use Facebook, but they’re growing increasingly worried about their privacy. Even though we all use Facebook to connect, share, and stay in touch with friends and family, that doesn’t mean we want all of our private information out there for the entire world to see. Today, the only thing growing faster than Facebook’s user base is the number of its users setting their privacy settings. Facebook privacy is complicated, but we’re simplifying it. We stay on top of Facebook privacy changes so you don’t have to. If you’re confused by Facebook’s 7,000-word Data Use Policy and it’s more than 40 separate privacy settings, you’re not alone. That’s why we made PrivacyWatch, an email alert system that tell you when Facebook changes its privacy policies and gives you exclusive, step-by-step instructions from our experts on what you should do to protect your personal information. You can also check out our list of the top 7 Facebook privacy settings you need to make, and follow our blog for Facebook privacy news and tips. And if you’re in San Francisco or New York City on Tuesday, 5/15, come to our flash mob for privacy! To illustrate that you’re being followed on the Internet, we’re having a huge conga line of people follow each other through the city. Just for showing up, you’ll get a free privacy t-shirt and we’ll donate $1 to the National Network to End Domestic Violence on your behalf. Click here for more details.